Born wet and wide-eyed as a literary genre near the end of the last century, "steampunk" is just a word encompassing a litany of sins. When you hear the word "steampunk", what comes to mind? Aviator goggles and ray guns, bustles and corsets, high-tech dirigibles and perhaps…round, brass, clockwork-styled gears? Such clockworks are arguably the single visual image representing the genre, fashion, and subculture of steampunk. 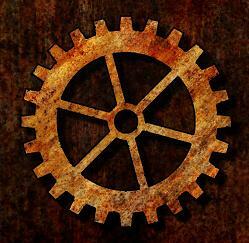 These gears are found gracing all things steampunk: websites, fiction anthology covers, jewelry, art. I find the gear a particularly intriguing and loaded symbol. It's not uncommon to find a single gear used as a symbol, despite that the entire point of such clockwork design is its interaction with other mechanisms and gears. So, what, then, is an out-of-context single gear? It looks very much like a mandala. Steampunk type gears are usually divided into at least 4 sections coming from a center point, with gear teeth around the edge. 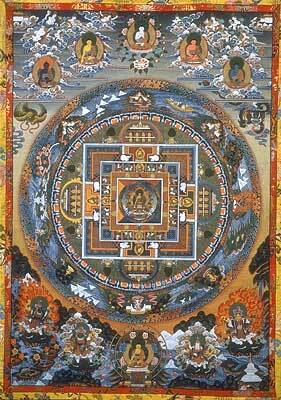 This fairly represents the organization of traditional mandalas, which generally have a central point, divisions of the inner circle, and evenly spaced accoutrements, figures, and scenes around the outer circle edges. Could the gear symbol of steampunk be such a device as well? The focus on Victorian culture, style, and sensibilities within steampunk is telling. People living around the turn of the last century were facing all manner of huge upheavals and unknown outcomes. It's a phenomenon that has been referred to as fin de siècle, or "end of the century." From the fin de siècle entry at Wikipedia: "…the expression fin de siècle is used to characterize anything that has an ominous mixture of opulence and/or decadence, combined with a shared prospect of unavoidable radical change or some approaching "end." Steampunk itself mirrors these dynamics, being a mixture of "opulence and decadence"—the ornate, lush, and formal Victorian style, mingled with the anachronisms, contradictions, and hardness of high-tech devices and mechanisms. It seems we're facing our own fin de siècle phenomena; there's the 2012 apocalyptic countdown, AI android teachers, the newly identified "missing link", (arguable) proof of life on Mars, the do-or-die "going green" dynamic, and a general sense of something big looming ahead. So, the increasing popularity of steampunk, and within its framework, its agreed-upon symbols should be no surprise. And, with the fin de siècle phenomenon still in mind, that the chosen, ubiquitous symbol is part of a clock seems fitting as well. Changeable, moving, time; interactions, and coordination, intricacies, complexity, organized chaos, mechanics, technology, human creation and measurements; going forward in one direction, yet going "around", never going backward, "getting in gear", "making time", "changing gears." These are all ideas and expressions that fit the steampunk symbol of clockwork, and may also easily be applied to a general state of affairs in these years after the millenium.